A condition, or a delusion, that things appear to be more beautiful than they really are. 1. An illusion in which objects appear larger than their actual sizes. 2. A medical condition in which everything perceived by the eyes appear to be bigger than it really is, often as a result of a retinal disease or a brain disorder. 3. The visual perception of objects as being larger than they really are. The perception of objects as being larger than they are. Loss of sight in one or more meridians of the visual field. 1. 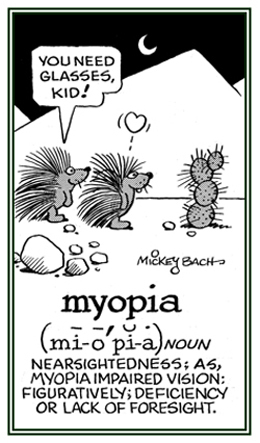 A nearsightedness or the ability to see close objects more clearly than distant objects: Myopia can be caused by a longer-than-normal eyeball or by any condition that prevents light rays from focusing on the retina. 2. A lack of imagination, discernment, or long-range perspectives when thinking about or planning something: Due to a condition of myopia, Ricky had real problems with making future arrangements by not being able to envision what to do the following year. © ALL rights are reserved. 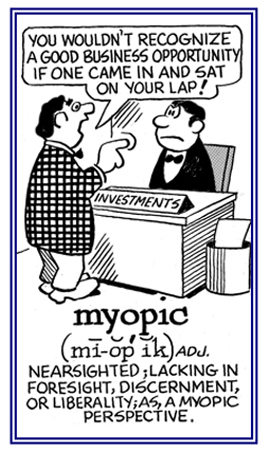 Referring to, relating to, or suffering, from nearsightedness: After her appointment at the ophthalmologist's, Simona found out that she was myopic and finally understood why she couldn't see objects in the distance. © ALL rights are reserved. 1. Characterized by a visual defect in which distant objects appear blurred because their images are focused in front of the retina rather than on it; nearsightedness. 2. Relating to the lack of discernment or long-range perspective when thinking or making plans. A visual examination, and dissection of a dead body, to determine the cause of death or any changes that were produced by disease. Dim or cloudy vision from lessened transparency of the ocular media. 1. Night blindness; failure or imperfection of vision at night or in a dim light. Smoking tobacco may impair the ability to see at night. Hypoxia associated with being above sea level in an aircraft will also decrease night vision. 2. The inability to see well under scotopic (dark) conditions, due to faulty rod function. The “rod” used here refers to any of the photoreceptor cells of the retina serving scotopic vision. “Scotopic vision” designates the dark-adapted state of vision, in which color perception is replaced by shades of black and white. It is served by the rod photorecptors. 3. A condition of the eyes in which the person can see well during the day, in a strong light, or on bright days, but see poorly at night, in a faint light, or on dull or dark days; night blindness; day sight. 4. The opposite of nyctalopia is hermeralopia, or day blindness. Reduction, or dimness, of vision at night without visible eye changes. Night blindness; failure or imperfection of vision at night or in a dim light, with good vision only on bright days.